Moderating a session on hiring and firing staff in Asia using a comparative approach with my panellists Edward Sun from Hengtai Law Offices in Shanghai, LiPu Lee from Formosan Brothers in Taiwan, and Suwit Suwan from Navinlaw LLC Primerus in Thailand was interesting and done in a very interactive way including input and questions from some of the 60 attendees involved in legal practices in Hong Kong. 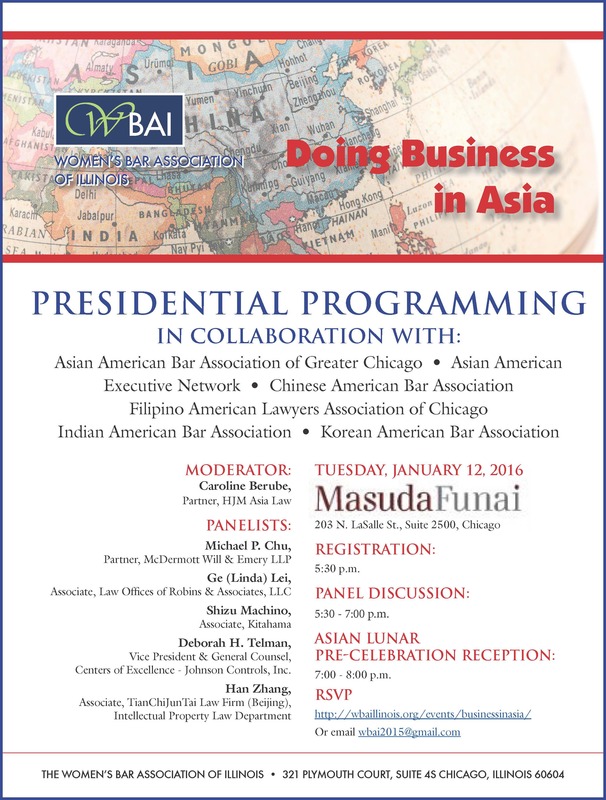 This session was part of the program organised by Primerus, society of world’s top independent boutique law firms. The program was held in conjunction with the Association of Corporate Counsel International Legal Affairs Committee in Hong Kong. The full program of the seminar can be viewed here. HJM Asia Law partnered with Yulex Attorneys in the Montreal, both Interlegal members, an international legal association, to bring the “Risks related to commercial contracts in Asia” seminar to their contacts and clients. Caroline focused on topics such as getting paid by your clients in Asia, dispute resolution and cultural differences. The event was a great success with the legal community in Montreal and we look forward to organizing more events with Yulex in the near future. Caroline Berube was a guest speaker at the seminar organized by the Temple University Japan Campus. The seminar was titled “Investors Beware! – Pitfalls in Commercial Contracts in Asia: Focus on China and Singapore” and covered topics such as 1. Key terms in sale and purchase agreements, distribution agreements and joint ventures; 2. Validity and meaning of MOU, Letter of Intent and NDA: their consequences; 3. How to find the right International sales agents/ distributors and tools to assess your partner; 4. How to get paid by your clients overseas?; and 5. Suing in the US or overseas: the challenges, costs and timeframe. It was Caroline’s first time working with Temple University and she looks forward to future joint events together. Caroline was a speaker at the KCBA’s Commercial Law seminar which took place in Geneva, Illinois. She was a speaker on the topic of “Investors Beware! – Pitfalls in Commercial/UCC Contracts and IP Risks in China and Asia in General”. Caroline has extensive experience with cross-border contracts in Asia and shared her knowledge on China and South East Asia in particular. Topics covered inlcuded assessing distributors and manufacturers, key clauses in contracts, getting paid by Asian clients, protecting IP in Asia and dispute resolution. On October 27th 2015, Caroline Berube discussed the implications of changing intellectual property rights and protections in China and Singapore on the business activities in Asia. The talk was convened at the Chicagoland Chamber of Commerce in Chicago with Caroline as the keynote speaker. The talk touched on topics such as Trademarks, Contracts, Industrial Designs and the Particularities of Intellectual Property in China with a particular emphasis on Singapore and China. During the talk, Caroline Berube, drew from her wealth of knowledge to discuss the particularities of the judicial systems in China and Singapore – thereby providing an in-depth understanding of the topics at hand. 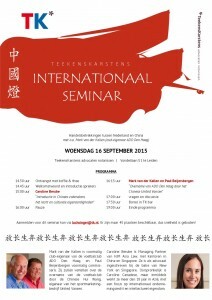 HJM Asia Law partnered with TeekensKarstens Advocaten Notarissen in the Netherlands to bring the “Doing Business in China” seminar to their contacts and clients. Both of the firms are members of the Law Europe International network. Caroline focused on topics such as HR and Employment, Pitfalls in Cross-Border Contracts, Disputes, IP, Comparison between a Representative Office Setup and the Wholly-Owned Foreign Enterprise, and Cultural Differences When Negotiating a Contract in Asia. The Singapore Human Resource Institute (SHRI) organized another seminar with Caroline on the topic of firing. The process of firing is different in most jurisdictions and a very sensitive topic, especially with the growing presence of social media. Employers want to act in compliance with their corporate policies and local laws. Singapore, China and Hong Kong have different laws and regulations depending on the seniority of employees and the industries. With recent changes to improve regulations and rights/obligations of employees and employers, there are many pitfalls to avoid financial costs and reputational damages for the employers. During the seminar Caroline discussed the practice of hiring and firing in Singapore, China and Hong Kong, including topics such as: reasons for termination, consequences, procedure and differences between dismissal/resignation between local and foreign employees. In addition, attendees learned about compensation payments, the cost of labour arbitration and the neutrality of judges when disputes are escalated. Arbitration options and court systems in China (timing, costs, neutrality of the judges/arbitrators). Singapore Human Resource Institute (SHRI) organized a seminar lead by Caroline Berube on the topic of “How to Avoid Pitfalls in Labour Laws and Issues in China.” The objective of this course was to introduce the key terms of labour laws in China with a special focus on Guangzhou and compare them with Hong Kong labour laws. 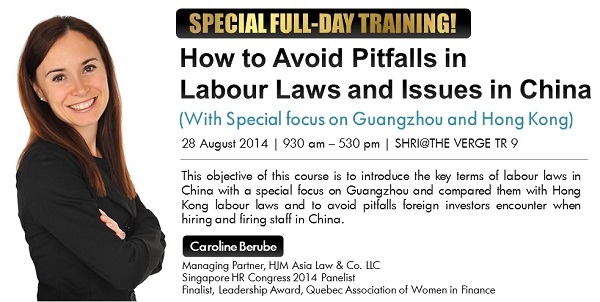 The seminar discussed avoiding pitfalls foreign investors encounter when hiring and firing staff in China. Additionally, seminar focused on employment contract conclusion and termination of employment, employee’s benefits, social contributions required, leave, working hours and some local specificities. Caroline Berube is one of the speakers at the seminar organized by the Agri-Food Export Group Québec–Canada, the largest association of agri-food product exporters in Canada (http://www.groupexport.ca/en/). 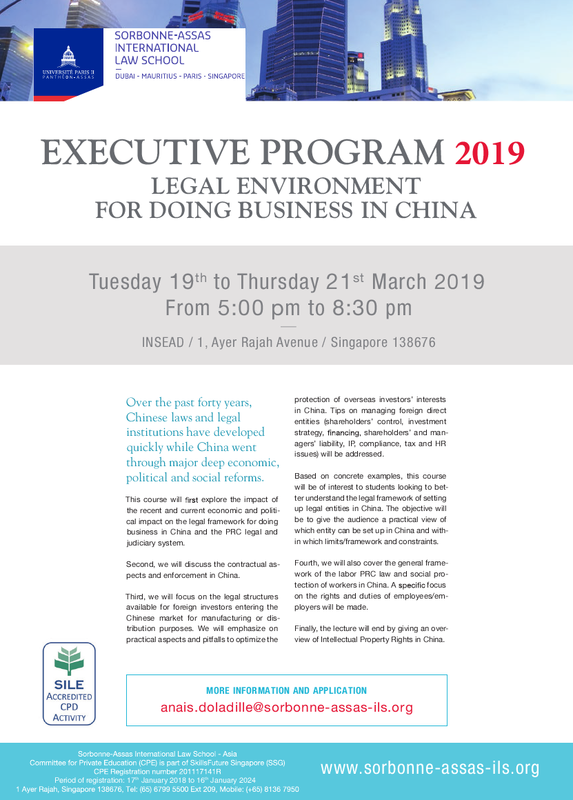 The workshop is titled “Doing business in China without losing one’s shirt” or “Faire des affaires en Chine sans y perdre sa chemise.” The presentation will be conducted in French and Caroline will speak about doing business in China and the Chinese Business Law. 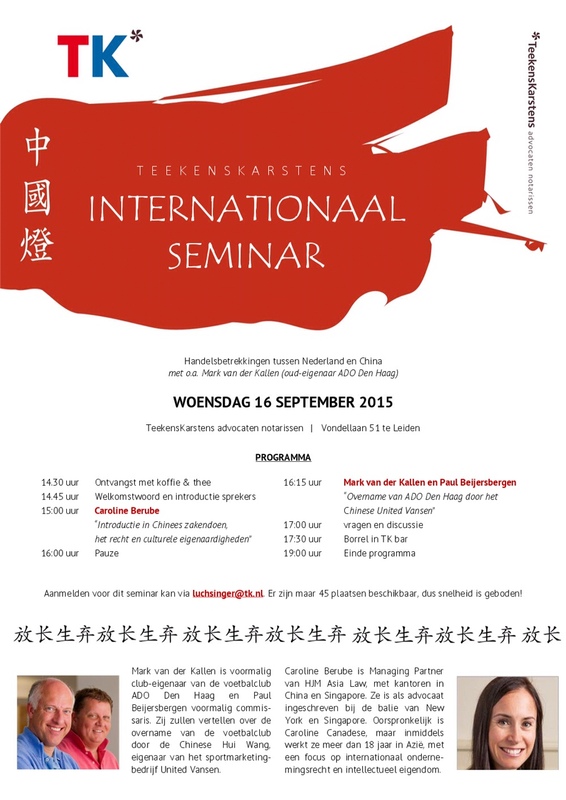 The complete list of speakers and the seminar outline can be viewed here: Chine-Invitation. HJM Asia & Cajola Managing Partners, Caroline Berube and Riccardo Cajola, are pleased to once again take part in the annual one-day seminar in Milan at A.N.I.E., the main Italian industry federation of both manufacturing and trading industries dealing in electric and electronic products depending on Confindustria (www.anie.it). The seminar takes place on Tuesday, May 21st, 2013 in Milan, Italy. This year’s theme is “How to organize a distributorship chain of electric/electronic consumer products in the Asia Pacific Rim”. The topics addressed will include: contracts, tax, protection of IP, as well as specific profiles from various Asian countries, including China, Taiwan, Korea and Australia. 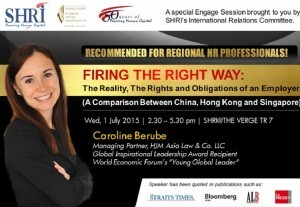 HJM Asia Managing Partner, Caroline Berube, will be giving a talk in Hong Kong for the Canadian Chamber of Commerce. During this seminar, Caroline will discuss the hot topic of labor law in China, hiring and firing of Chinese and foreign employees in China. Attendees will gain a better understanding of the reality, the rights and obligations of employers. Please head to the event calendar at the Canadian Chamber of Commerce in Hong Kong to find more information: http://www.cancham.org/asp/calendar_front.asp. As Canadian and other global companies grow their Asian operations, the reliance on Chineses suppliers is increasing. Business leaders in Singapore often have responsibility for operational growth and supplier relationships in the complex Chinese business environment. During this CanCham Breakfast Seminar, HJM Asia Managing Partner, Caroline Berube, will provide her expert insights on optimizing business outcomes with Chinese suppliers, while getting legal practical tips when preparing POs/contracts and protecting your intellectual property rights. Readers interested in attending can access more event details from the event calendar page at the Canadian Chamber of Commerce in Singapore: http://www.cancham.org.sg/events/current. HJM Asia is delighted to announce its cooperation with IE Singapore in the upcoming iAdvisory Seminar for China. Representing the legal aspects of employment, Caroline Berube will discuss the hiring and firing of foreign and local employees in China. We invite readers and interested attendees to find full event details at the following link: http://www.iesingapore.gov.sg/wps/wcm/connect/ie/My+Portal/Main/Campaigns/Campaigns+2012/iAdvisory+seminars/iAdvisory. HJM Asia Managing Partner Caroline Berube will discuss “10 Ways to Do Better Business in China” at a seminar hosted by the Chicagoland Chamber of Commerce International Trade Centre. Caroline will share with the attendees her wealth of knowledge and experience gained from doing business in China for more than a decade. Managing Partner Caroline Berube will be speaking on intellectual property in China from the Railway Industry’s perspective at the seminar “China – Fact Finding Mission, Swiss Railway Industry to China” organized by the Swiss Business Hub China. Caroline will discuss practical ways to protect IP in China. HJM Asia Managing Partner Caroline Berube presented the topic “Doing business in China, set up a business entity and get protected in China, legal dos and don’ts” at a conference on “China Seminar: business opportunities, strategies and development of new urban centers” hosted by the Chamber of Commerce of Montréal. HJM Asia Managing Partner Caroline Berube spoke on the topic “Intellectual Property in Asia” at a seminar hosted by Goudreau Gage Dubuc S.E.N.C.R.L. Caroline covered intellectual property laws in various Asian districts and discussed practical ways to protect trademarks, patents, copyrights and trade secrets. Riccardo Cajola and Caroline Berube from HJM Asia & Cajola together with John Donohue from Thorp Reed & Armstrong, LLP and Douglas Smith from Habib Al Mulla & Company will be speakers at a seminar organized by ANIE on “Manufacturing and distribution in the global market: what business need to know about contracts, taxation and intellectual property”. Riccardo Cajola and Caroline Berube from HJM Asia & Cajola were speaking at a seminar organized by the Meccatronica & Sistemi Avanzati di Produzione and the Italian Chamber of Commerce in Singapore on corporate and tax aspects in Singapore. HJM Asia Managing Partner Caroline Berube, in association with Michelle J. Rozovics, partner at Rozovics Law Firm, spoke at a seminar organized by Dobbe Marketing & PR. Caroline touched on how to protect commercial and legal interests in China and Singapore. HJM Asia Managing Partner Caroline Berube was speaking at a seminar organized by the Canadian Chamber of Commerce in Singapore on “Singapore: a legal and tax platform for business in China and Vietnam”. HJM Asia Managing Partner Caroline Berube was a speaker at the iAdvisory Seminar Series: Doing Business in China, A special focus on West China – Chengdu, Chongqing and Xi’an. Caroline was speaking about “How to safeguard your intellectual property rights?”. For more information, please click here. HJM Asia Managing Partner Caroline Berube was speaking at a seminar organized by the Center for International Legal Studies (CILS), on “Arbitration in Asia: a cultural approach of this legal way of solving conflict in China and in Singapore”. 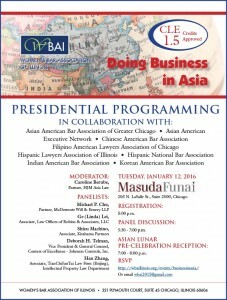 HJM Asia Managing Partner Caroline Berube, in association with Michelle J. Rozovics, partner from Rozovics Law Firm, spoke at a seminar organized by the International Trade Association of Greater Chicago. The topic was “Maximize your profits and minimize your risks in China by understanding your sourcing contracts”. 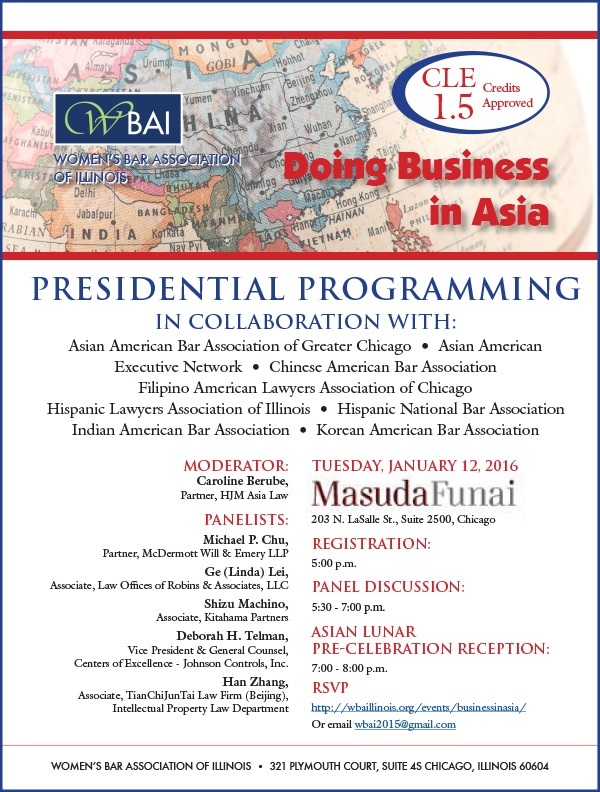 HJM Asia Managing Partner Caroline Berube was a speaker at a seminar organized by the Chicagoland Chamber of Commerce. The seminar was held in Chicago, at the Chamber’s office. The topic of the seminar was “How to protect your interests in doing business in China” and “Do you need to set up a company structure to protect your interests in China? 4 ways to do business in China and the pitfalls to avoid”. HJM Asia Managing Partner Caroline Berube and Jade & Co. General Manager Maxime Berube were the key speakers at a seminar organized by Carrefour Quebec International. The topics were “Various strategies to improve your supply chain in Asia” and on the legal side “How to protect you business and avoid pitfalls when doing business in China?”. HJM Asia & Cajola Partners Caroline Berube and Riccardo Cajola were the speakers at a seminar organized by the Italian Chamber of Commerce in Singapore. The seminar was held at the ESSEC Campus. The topic was “Rules and statutory regulations: products labeling made in Singapore, China and Italy”. HJM Asia & Cajola Partner Caroline Berube was a speaker at a seminar on “The new procedures for working permit application in Shenzhen” organized by the China-Italy Chamber of Commerce. HJM Asia Managing Partner Caroline Berube was one of the speaker at a seminar organized by the Investissement Québec on Chinese market. HJM Asia Managing Partner Caroline Berube was a speaker at a seminar organized by the Financial Women’s Association of Québec on “How to do business in Asia?”. HJM Asia Managing Partner Caroline Berube was a speaker at a seminar for business people on “How to succeed in China” organized by the Centre of International Studies, University of Montréal. HJM Asia Managing Partner Caroline Berube was a speaker at a seminar organized by QiaoLinxInc and University of Montréal on “Doing business in China”. HJM Asia Managing Partner Caroline Berube was a speaker at a seminar on “How to do business in China?” organized by Lagacé Legault LLI. HJM Asia Managing Partner Caroline Berube was a speaker at a seminar on “Doing business in practice” organized by the Board of Trade of Metropolitan Montréal (www.ccmm.qc.ca). HJM Asia Managing Partner Caroline Berube was a speaker at a seminar on “Doing Business in China” organized by the Commission de Developpement Economique de la Beauce. HJM Asia Managing Partner Caroline Berube was a speaker at a seminar on “A practical guide for doing business in China” organized by the Québec Trade Mission led by the Prime Minister of Québec Jean Charest. HJM Asia Managing Partner Caroline Berube was a speaker at a seminar on “Doing business in China” organized by the Québec Trade Mission led by the Prime Minister of Québec Jean Charest. HJM Asia Managing Partner Caroline Berube was a speaker at a seminar on “Doing business in China” organized by the Association de la recherché industrielle du Québec. HJM Asia Managing Partner Caroline Berube was a speaker at a seminar on “How to set up a WOFE or a joint-venture in China: case study of two Canadian companies” organized by the Board of Trade of Metropolitan Montréal. HJM Asia Managing Partner Caroline Berube was one of the speakers in a seminar on “Business in China” organized by the Canadian Institute. The topic was “Finding your way through the government agencies: what you need to know now”. HJM Asia Managing Partner Caroline Berube was a speaker at a seminar on “Doing business in China” organized by the Business Development Bank of Canada and the National Bank of Canada. HJM Asia Managing Partner Caroline Berube was a speaker at a seminar on “Qualified foreign institutional investors” organized by the Québec government and Caisse de dépôt. 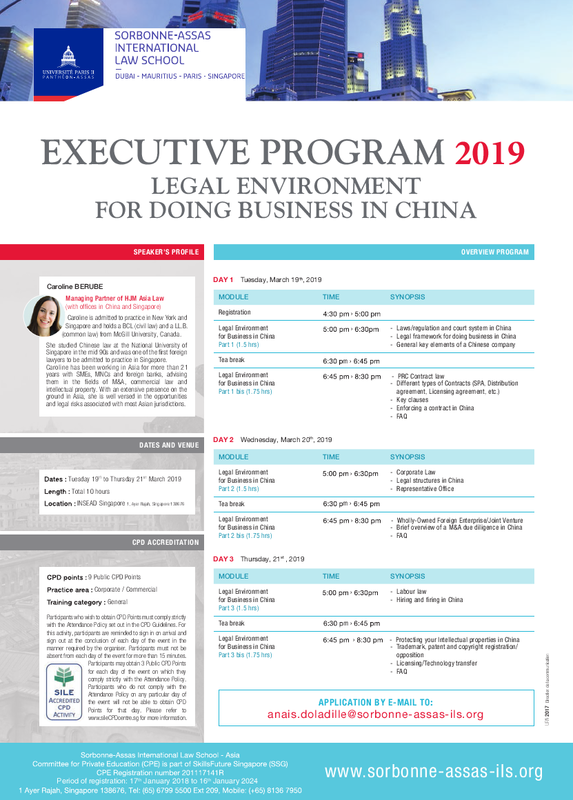 HJM Asia Managing Partner Caroline Berube was a speaker at a seminar on the “Legal pitfalls when doing business in China” organized by the Canadian Consulate.